Sylvie Davidson and Gregory Harrison in The Man Who Shot Liberty Valance. 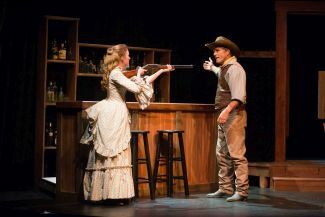 Liberty Valance now playing at the Rubicon Theatre. Written by Jethro Compton and adapted from the short story by Dorothy Marie Johnson, the action packed play follows the short story much more closely than did John Ford’s legendary film of the same name. From the opening scene, the powerful portrayals of the story’s characters captured the audience and actors were rewarded with standing ovations and cries of bravo. We seemed to be privy to some very private conversations and altercations that were taking place on stage. In the opening scene, an authentic looking old west saloon sets the stage for the entrance of a mysterious cowboy who discovered an injured and unconscious man on the prairie and carries him into the saloon owned by a spirited saloon-owner, Hallie Jackson. From there, the extraordinary cast of characters evolve, changing their feeling towards one another, finding compassion, caring, love and hate along the way. It’s also a tale of love, honor, ambition and revenge. Gregory Harrison, a Broadway and TV veteran known for his recurring role on several TV shows, films and Broadway shows, is a familiar face. His portrayal of a tough guy with a heart in The Man Who Shot Liberty Valance made him a sympathetic character although still a tough guy. Another well-known actor, Jeff Kober portraying Liberty Valance, could not have been more ruthless. He too has an impressive list of credits for plays, movies and TV shows and often portrays the bad guy. The only female in Liberty Valance, Sylvie Davidson, held her own and then some with a stage full of rough and tumble men of the old west. We see her evolve from a tough little shrew to ….well, you’ll see. And Jacques Roy, as the educated stranger, against the odds, tries to make changes for the better in this wild west community. The supporting cast all enhanced the story with my particular favorite, Dorian Logan, portraying a humble but highly intelligent best friend of Hallie, the saloon owner.